I would like a way to directly rate (manually) the audio files and it should not be written in some database file but directly to the ID3 tags of the mp3 (or other) files. Another option is to use masstagger component and create an "add value" script (for example field name: RATING, field value: 5) and then bind foobar keyboard shortcut to that script (for example ctrl numpad 5). Thank you for replying, I tried both the methods (playbar statistics (also enabled the checkbox) and quick tagger) but none of them writes back to the actual file, I'm using windows 10 x64. Can you please tell me what am I doing wrong. Editing tags most definitely edits the file. I can only assume whatever means you use to check the change is something incompatible with foobar2000 way. This is WSH playlist viewer by BRTT. Is very simple and easy way to operate your music files. You can choose there any color for background and for playlist fonts color. As you see this file tagged manually. All tags written in file. He's merely asking to rate his tracks. Kinda seems a bit overkill to suggest a complete playlist viewer that's also very outdated. There a valid and working suggestions made in this thread which don't require a full playlist viewer. Besides, your suggestion would only work under columns ui which you don't know if OP is using it. Or would you expect OP to completely switch to Columns UI merely for tagging? WARNING: Be sure to avoid the bad advice from the Microsoft Support person. The problem here is you are dealing with Microsoft logic. Outdated but working and it isnt need CUI it runs on F2K DUI. If you have a better offer for him its ok. If you want to add a column that shows the rating there are once again many ways. If you use Default UI you can right click on the column header line, select "Columns" -> "More...", click "Add new" and give the new column name "Rating". If you just want to see a number you can use pattern "$if2(%rating%,$meta(rating))". The reason the pattern is so complex and not just %rating% is to make it work both for rating coming from the Playback Statistics component and for rating value stored in tag. Once you have defined the new column close the preferences dialog with OK button and enable the newly added column by right clicking on the column headers again, and select Columns -> Rating. Edit: If you just want to find music you have rated earlier select main menu entry "Library" -> "Search" and use search query NOT %rating% MISSING. If you have Playback Statistics component installer and the rating is not in its database but in tags, you can use query NOT "$meta(rating)" MISSING. Outdated and unsupported. Read the thread, I did. Even so, your suggestion is way overkill. End of story. Important note: for unknown reasons, Microsoft have added a Write media information changes to files setting to WMP in the Spring Creators Update of Windows 10, and have defaulted it to *off*. 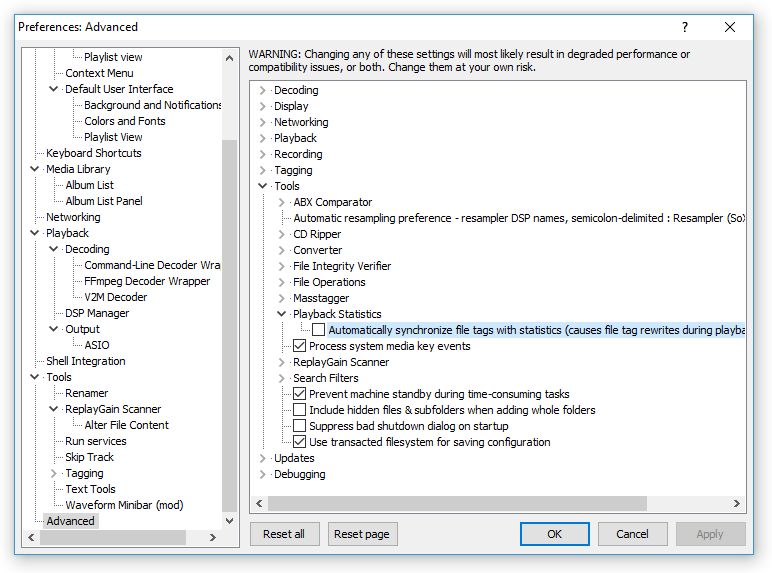 That means that by default, any tag changes made in WMP's library aren't written back to file, both for natively supported formats and for formats supported through WMP Tag Plus. I would *strongly* recommend anyone making tag changes in the library (including using Windows Media Player Plus! 's tag editor) to turn that setting on - it can be found through Tools - Options - Library (press Ctrl+M if you don't see the Tools menu). That's right, by default, Windows Media Player no longer alters your actual files' tags, but merely stores tag changes in its database! Overkill is the name of the thrash metal band. Overkill is the the song of Motorhead. And thank you to give me a right of freedom of speech. You again. I made myself clear the first time, it seems you just don't seem to get it. That's not my problem. If you want to go out and post stupid unrelated stuff you won't get away with it here. Do continue....see what happens. Don't waste my time with your BS. If files are mp3 ones then ID3 tag revision also matters. Windows Explorer reads most likely only ID3 2.3 and DOES NOT read ID3 2.4. You'll have to update your files in foobar to use strictly ID3 2.3 and set it to enforce writing them in exactly this version. It might be also helpful to set "Rating" one of your standard fields in Properties window (go to Advanced Preferences in foobar, then Display, Standard Fields). If files are FLAC then you most likely need to install 3rd party property handler for Windows Explorer. This is valid for at least Windows 7, Windows 8/8.1 and some versions of Windows 10 (prior to 1711 - I haven't used any Windows 10 starting from this version). Well. Someone call me there a troll etc. I am not going to justify myself. I gonna show you the screenshots. Then i just suggest you to be a little nice to the people. Nobody cares, get over it. You're an annoying individual who can't take it when someone talks back a little. You're childish and butthurt and just proved that yourself once over. I'm not gonna waste any more time on your antics. Have a nice day. As I said before, grow up, learn to take criticism and don't start whining and trying to shame people towards other members to get back at them. How old are you? 15? Pathetic.